I've worked as an employee and consultant, in a technical capacity, for tiny companies through multi-billion dollar corporations. With the exception of the companies where I've been a founder, I've noticed that the technical teams at these companies would have a hard time immediately detecting an attack or abuse unless it caused obvious damage to the functioning of their website. For small to medium size websites (< 5-10 requests/second/web server) the single most important defense against attacks is to continuously monitor logs. The simplest way to do this is to "tail" logs for all instances of the web server, app server, and security logs (ssh, DB, etc) 24/7 on either a system admin's or developer's computer. 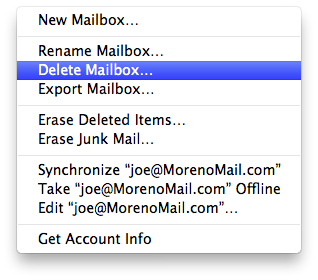 It would be great if this could be automated, but, many times, it's going to take a human to notice something abnormal. Most abuse/attacks on a website begin with probing the website itself (port 80/443) or via SSH (port 22). Once abuse or an attack is noticed from a centralized source, the first step should be to block that IP address and then contact the ISP of the attacker/abuser ideally with a phone call to their network operations center or via their abuse@example.com e-mail address which is usually listed when conducting a whois lookup. In either case, the offending ISP will ask for a copy of your server logs which should be cleansed of any third party data. In other words, only send the offending ISP a copy of the logs that specifically pertain to the attacker/abuser. Also, don't include too many log parameters on web requests lest you suffer from scrolling blindness. The logs have to be readable, in real time, by a human. For unusual periods of peak traffic, it helps to tail and grep the logs in real time to focus on specific log entries. You'll be amazed at how much you'll learn by simply monitoring these server logs on a daily basis, for just a couple weeks; it will give you a sense for what is normal traffic. Errors, unusual requests, and long response times should be investigated. Some of these issues will be web app bugs or areas requiring optimization which may have never been detected (such as an internal report taking minutes to respond when a typical request/response takes less than a second). Frequent attacks go unnoticed until there is some ramification. If you don't know what normal behavior is then you won't be able to detect abnormal behavior. How to squeeze more than 140 characters into a tweet with indexable text. Last Friday, I half jokingly sent out a tweet demonstrating how to squeeze more than 140 characters into a tweet. Basically, I tweeted that it was possible to take a screen shot of text longer than 140 characters which could then be attached to a tweet as an image. I say half jokingly because, even though it works, it's a bit of a hack. It wasn't until Dave Winer – who actually didn't support this technique – retweeted me that I saw a surprising interest in it. The interest probably wasn't so much the solution as it was the part that was a joke. One person called it "twaxing" (tweeting + faxing). And Dave half-joked, "the web cries" for me. But I noticed, over the weekend, that a number of people have started adopting this technique. It's handy that Twitter now, organically, hosts images on their servers which means that a link to an image in a tweet is much less likely to break when compared to hosting an image with a third party. A couple people pointed out the obvious shortcomings to the twax technique which was that an image of text isn't indexable (searchable). That got me thinking… what if a twax was indexable? Would there be any benefit for those times when you needed, say, 400 or 500 characters in a tweet? Perhaps. My initial twax search solution was to embed the tweet's meta-data in the text of the tweet but that is too ugly, inelegant, and incomplete. After some more thought, I realized a very workable solution: embed the tweet's meta-data as a QR code inside the tweet. Any third party server could simply scan the image and decode the QR code while any human could read the text. Technically speaking, this will work. But, would anyone use it and how would it work? I can easily see a mobile app or Twitter web feature that would notify you once you exceeded 140 characters while continuing to let you type. When you clicked the Tweet button, to publish your tweet, the tweet would contain the first 140 characters of the tweet while the entire tweet's text would be displayed in the image, followed by a QR code of the tweet's text and meta-data. The nice thing about this technique is that a single QR code can encode thousands of characters of text. Plus, the tweet text and its image with the QR code could stand alone without network connectivity. "Why should a private American citizen own an assault rifle?" asks the city girl. "Because it's my Second Amendment right," answers the farmer. Does the U.S. Constitution contain amendments that have outlived their purpose? Certainly. The best example is the 21st Amendment which repealed the 19th Amendment on Prohibition. What about the Bill of Rights? No Amendment in the Bill of Rights has ever been repealed. The Third Amendment of the Bill of Rights, which prevents soldiers from being quartered in a home without the owner's consent, has certainly outlived its purpose. The U.S. Military is so large and well funded that there's no need to quarter soldiers in private homes. Repeal the Third Amendment and America doesn't skip a beat. 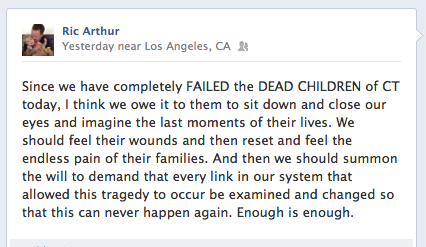 Surprisingly, yesterday's shooting isn't the largest K-12 massacre. In 1927, a disgruntled tax payer used dynamite to kill more than 40 people, including 38 elementary school children in Bath Township, Michigan. So, what about the Second Amendment which gives American citizens the right to keep and bear arms? Could that, too, have outlived its usefulness? What were our forefathers thinking when they drafted this amendment? The Second Amendment serves several purposes. In 18th Century America, a typical citizen may own a firearm for hunting and protection. Constables didn't cruise the suburbs to maintain law and order 200 years ago. And there was no way to call 911 for help. Big chain supermarkets and grocery stores didn't exist with stocks of food that you could store in your refrigerator. Hunting was a big part of survival. But, beyond these reasons, there was another key purpose for 18th Century Americans to own firearms which was to keep the government in check. With the exception of the cannon, private American citizens were on even footing with the government when it came to weapons. Automatic weapons didn't back then, nor did weapons of mass destruction. In the 18th Century, a battle between private citizens and government backed troops was nearly an even match in terms of firepower. It's clear that this is no longer the case. The U.S. Government has weapons of mass destruction and no reasonable person could make the case that private American citizens should own tanks, bombs, or missiles. How does the current state of military hardware affect the Second Amendment? A matchup between the U.S. Government and its private citizens is not even close to a fair fight. Should Americans own any firearms? Should private firearm ownership be better controlled? Could it be better controlled? Even if private firearm ownership was eliminated, would people take to other forms of attack such as the Bath Township massacre or the Shoe Bomber? Bad people can always find big ways to hurt good people. Look no further than the 9/11 attacks to see how machines of peace can be turned into weapons of mass destruction. Could schools be made more secure, similar to airports? Even if that's done, kids will still go outside to play which is where two elementary students were shot, two years ago, in my own town of Carlsbad. Here's something important to consider… think critically of your ideas. If you think the Second Amendment should stand as is, consider yourself wrong. If you think the Second Amendment should be repealed, once again, consider yourself wrong as you think consider workable solutions. Not being able to critically examine your own thoughts and ideas leads to closed-mindedness. Which is more important: your privilege to drive a car or your right to keep and bear arms? There's no simple solution – but at least all sides agree that something needs to be done to prevent a repeat of yesterday's tragedy. Steve Jobs frequently referred to personal computers as a bicycle for the mind. When Steve was about 12 years old, he read a study that measured the locomotion efficiency of different species. At the very top of the list was the condor, who expended the least amount of calories to travel. Humans, on the other hand, came in an unimpressive third of the way down the list. Steve points out that someone at Scientific American took a look at the efficiency of locomotion of a human on a bicycle which blew away all other forms of animal powered locomotion. After all, the bicycle is the most efficient human powered machine for locomotion. It's an interesting metaphor since it seems so accurate – it's the amplification of human ability. I recently upgraded from my iPhone 4S to an iPhone 5. I've been using iCloud for backing up my iOS devices for the past year, so I was somewhat familiar with it. The first time I used iCloud to restore my iPhone data, in March, it didn't work well – actually, I gave up on trying to recover my camera roll with 12,000+ photos since it was already backed up on my desktop. It was just taking too long. For my iPhone 5 restore, I waited it out. It took about 60 hours to recover my 30 GBs of backups stored on iCloud. It seemed as if each photo took about 10 seconds to restore. 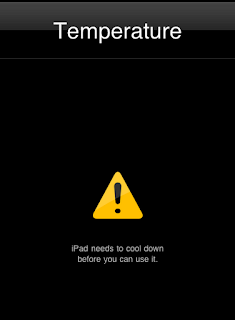 Of course, there were about 8-12 hours in there when I wasn't on WiFi and the iCloud recovery process was paused. So, let's call it 50 hours. Why so long? Because it requires a lot of time to download that much data from iCloud, regardless of how big the pipe is (bandwidth) on your end. Unlike iTunes movies and music downloads, which happen in a jiffy, iCloud restores do not gain any benefit from content deliver networks (CDNs) such as Akamai or Amazon's CloudFront. A CDN will cache data, like movies, on servers that are as close to you as possible. That way the bits are only traveling, say, 100 miles, instead of thousands of miles. Less hops means faster delivery. Once the iCloud restore was complete my iPhone then downloaded my apps, music, movies directly from the iTunes store, which did benefit from a CDN. Rather than store this information in my own iCloud storage Apple just keeps it on their servers since this information isn't unique. My last step was to resync with iPhoto to recover my photo albums – after all, iCloud only backs up your camera roll. In the end, I didn't lose anything, it just took a very long time. For my next iPhone upgrade, I will backup my data via iTunes on my computer. Just keep in mind... if you have a 64 GB iPhone, you should make sure that you have at least 64GB free on your computer before trying to back it up. This post is a response to Professor Fleming's article, The Few, the Proud, the Infantilized, published earlier this week. It is by no means enough that an officer of the Navy should be a capable mariner. He must be that, of course, but also a great deal more. He should be as well a gentleman of liberal education, refined manners, punctilious courtesy, and the nicest sense of personal honor. I read Bruce Fleming piece entitled The Few, The Proud, the Infantilized. The knee jerk reaction of many of my fellow service academy graduates might be, as was said in A Few Good Men, "I would rather you just said thank you, and went on your way. Otherwise, I suggest you pick up a weapon, and stand a post." However, I want to add some deeper insight. Some of Fleming's premises are right, but many of his conclusions are wrong, or, at least, incomplete. As a Naval Academy graduate, I can tell you that Fleming is spot-on with his facts regarding the perception of midshipmen. From his articles and his book, Annapolis Autumn, I'm amazed at how much he gets right. He has the pulse of the Brigade of Midshipmen but without adequate context. Annapolis needs smart people who think differently, and, as painful as a pill it is to swallow, Professor Fleming's presence at the Naval Academy helps to keep us thinking critically about that institution. Mr. Fleming has extraordinary insight into the inner workings of the U.S. Naval Academy's academic machine. He has been a professor at Annapolis far longer than any superintendent, commandant, or academic dean has been in charge. He has probably seen a few mistakes made at my beloved alma mater; no system is perfect. However, the downside of his overexposure to the Brigade is that Fleming has become a perpetual midshipman. Without a doubt, a four year education at a service academy costs more than NROTC or OCS. However, his conclusion to eliminate or "repair" the academies, is shortsighted. I see Professor Fleming as a liberal thinker at a conservative institution; yet his propositions are too conservative in nature, while other comments, such as "Most of what the Naval Academy's PR machine disseminates is nonsense," are exaggerated. Fleming needs to take a holistic view of the service academies and their function within the military. I greatly disliked the Naval Academy when I attended it; but, you would be hard pressed to find a graduate who, after completing their military obligation, still maintained the same view of their respective service academy that they held when the attended it. ...in terms of cold mechanical logic, the United States does not need a Marine Corps. However, for good reasons which completely transcend cold logic, the United States wants a Marine Corps. Those reasons are strong; they are honest, they are deep rooted and they are above question or criticism. Replace the words Marine Corps with service academy in the above quote and it is equally valid. Things are not always what they appear. From the hottest fire comes the strongest steel is an old cliche with a deep truth. As a midshipman, we are put through trials and tribulations. Military indoctrination is the most extreme physical, academic, and emotional roller coster ride that one can experience at such a young age this side of combat or being a POW. On the surface, Plebe Summer may look like sadistic hazing. Every plebe is systematically set up for failure. They are scorned, yelled at, and punished. More stress and negativity is compressed into several weeks than is imaginable. Can this humiliation be productive? Just ask a graduate. Analyzing this and drawing negative conclusions, without experiencing it, is incomplete. What other academic institution of comparable size has such laser focus on the product it produces? None come to mind other than private military schools. More generals and admirals now ascend to flag officer rank not because the service academies are worse at what they do, but, rather, it is, I believe, because the other commissioning pipelines have vastly improved over the decades. At first, I took exception to Fleming characterization of service academies as a military Disneyland. But, then I reflected on my time as a plebe when I, too, thought the same thing and nearly quit so I could return to being a corporal in the Marines. That would have been shortsighted. I am much better off for sticking it out. The problem is that Fleming is standing too close to only one side of the equation without being able to visualize the bigger picture. He only sees the academic portion of the pipeline without participating in the full experience that extends past graduation. I cannot convey strongly enough the importance of what I learned at Annapolis that was never explicitly taught. Rather, it has to be experienced; and not in a classroom or on campus. For example, Fleming comments on sleep deprivation. Sleep deprivation taught me my capabilities and limitations of what I can and cannot accomplish when physically, mentally, and emotionally exhausted. In a civilian school, I would have simply slept in and skipped class. Midshipmen who skip class are punished for being AWOL. Most civilian school graduates who did not experience what I did in this area had to learn their reactions later in their careers; perhaps at follow on training after they were commissioned or when they were in an operational environment. It is much better to learn it in a safe academic setting where the repercussion of failure is minimal. Learning from failure is a huge part of success. "But the students I respect the most tell me that those who succeed do so despite the institutions, not because of them." Ahh, no truer words were spoken by a midshipman. I know the sentiment. Even as a "firstie" (senior) preparing for graduation, I too resented the Academy. I didn't just mark the days until graduation, I memorized them. But, alas, midshipmen are held to a higher standard than their peer college students while giving up more liberties than could be imagined. We don't do it because it is easy; we do it because it is hard and, ironically, we end up taking pride in what we hate. It's a great honor for an active duty academy graduate to return to their alma mater to serve in uniform five, ten, or twenty years after graduation. I would be eager to see professor Fleming anonymously interview these returning active duty alumni a decade after graduation. Is a service academy graduate better than an OCS or NRTOC graduate? No, but, the individual service academy graduate is, without a doubt, a better officer for having attended a service academy. Many standards at the service academies are higher than both civilian schools and the military, in general. I've seen midshipmen expelled from Annapolis for academic or conduct issues only to embark on a long, honorable career in the Navy or Marine Corps. I have also seen other students voluntarily decide that Annapolis wasn't for them, only to attempt, and fail, to follow another pipeline to commissioning. I would speculate that the tolerance of wrongdoings which Fleming witnessed at Annapolis were failures of the institution's human leaders, not the principles of the institution. Just like Fleming, I am personally very close to this issue. If it were not for Annapolis, I would not have become a Marine officer. In high school, and three years later when I applied to Annapolis, my SATs were 950, combined, out of 1,600, both times. That score put me in the bottom 36th percentile academically. When I sought admission, in 1988, the Naval Academy was the most competitive school in the nation with SATs averaging around 1,200 (if my memory serves). I graduated in the bottom half of a so-so high school. I was rejected by all the four year universities and two year community colleges I applied to. I had no motivation for college. Yet, despite this lack of self-discipline, I excelled in a military environment. Had it not been for the Naval Academy, I would not have graduated with a bachelor's degree from any other institution within four years. For many of us, the structure provided by the service academies is so important that it literally means the difference between success and failure. In this area, I frequently think about the success of Buzz Aldrin, West Point class of 1951. Once his disciplined structure was removed, after leaving NASA and retiring from the military, his depression demons surfaced. It's amazing what one can accomplish when he or she has the full force and good faith of the U.S. government behind him or her. I cannot stress to Fleming strongly enough that he is only seeing the tip of the iceberg. He is looking at a newly born baby and concluding that it is less capable than any other animal which can walk or swim right after birth. Judging the product of a service academy primarily by interacting with cadets or midshipmen is like judging a person's career at high school graduation. Midshipmen can be misinformed and hold on to those misbeliefs for a long time. Unlearning mislearned lessons usually requires a paradigm shift – one that midshipmen won't experience until years after graduation. It is easy to follow leaders. It is harder for leaders to lead followers. But, there is no harder leadership task than leading your own peers. Your peers see all of you, 24/7. Your motivations and beliefs must be pure in order for them to follow you. I think Fleming completely misses this experience. In the short term, an officer may fool both a senior or subordinate but it is nearly impossible to fool one's own peers. All will agree with Fleming that the service academies should reduce their worst flaws. But, it is not obvious what those flaws actually are, especially from the view point of a midshipman. And we need to approach change very cautiously. Regardless of national politics, no other country, or the U.N., maintains the same global commitments and responsibilities as the United States. A mistake in training our military service members cannot be fixed with a software update. We all know what is at risk. We can make the right decision for the right reasons and still get the wrong result if poorly executed. Perhaps, one day, the service academies will outlive their usefulness; but it will be obvious as applications decline and interest is lost. When the service academies become the telegram or slide rule for combat officer commissions, it will be apparent. But, in the mean time, we should keep in mind, as Fleming points out, that the service academies are a means to an end, not an end itself. Yesterday, I read Ernest Hemingway's A Day's Wait. It's about a boy who is waiting to die from the flu. He has a temperature of 102°. He heard that any temperature over 44° was deadly. For an entire day, he simply waits to die, not understanding the difference between Fahrenheit and Celsius. Once he learns the difference between the two temperature scales and that he's not going to die, he simply goes back to his every day routine, but he's a bit more sensitive to the world. Children are resilient like that. This story reminds me of two events in my life. The resiliency part brings back a specific memory when I was five years old. It was the first time my parents took me from Brooklyn to Huntington to show me the new house that we were going to be moving into. When my father told me that this would be our new home, I cried as we stood on the front lawn. I asked him, "What about my friends?" I was obviously upset that I'd be leaving my "life long" friends of just a couple years. My father hugged me and said, "You'll make new ones." That thought hadn't occurred to me. I could simply make new friends. As soon as he said it, it all made perfect sense and I was completely over the trauma of moving to a new world. 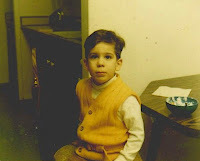 When I was about seven years old, I experienced the biggest miscommunication of my childhood. My parents were born in the mid 1930s and they grew up listening to radio programs like The Shadow, The Lone Ranger, etc. In the early 1970s, when I was about seven years old, they bought some cassette tape recordings of the old radio shows. One night, I sat with my entire family in our downstairs basement, which was laid out for entertainment. It was a game room with a wet bar, piano, organ, pool and ping pong table as well as a quadraphonic sound system. One of the recordings that we listened to was Orson Welles' radio drama of H.G. Wells' novel The War of The Worlds. The broadcast talked about Martians who had landed in Grover's Mill, NJ. I knew that we were listening to a recording of a radio broadcast from decades ago. And I knew that New Jersey wasn't very far away – I had been there frequently. But, I also knew if Martians had attacked us in the past, so close to our home, that it could happen again. So, when I asked my parents, several times, if these events had really transpired, they unknowingly answered, "Yes." Obviously, they were answering the wrong question. I was asking if Martians had really attacked us. They heard me asking if this performance had really been broadcast over the radio. I was reliving the panic of October 30, 1938, when many in the public thought the dramatic broadcast was real and fled their homes. Many listeners sued the network for "mental anguish" and "personal injury," but nearly all were dismissed. The newspapers may have played up the extend of the panic, but to me, and those before me, it was real. I was terrified and, unlike the resilience of finding new friends, it took me a while to get over the fear of Martians. 26 mile flight turned into 196 miles. A college classmate, who used to fly F/A-18s in the Marines, is now an airline pilot with well over 10,000 hours under his belt. He made a comment, last year, that no two flights are the same and there's always something to learn. I was safely reminded of his axiom, this past weekend. I took a buddy, who was visiting from out of town, on a flight to Sussex Airport that's about 20 minutes away. The clouds were dissipating as the afternoon progressed. Just to be on the safe side, I filed an IFR flight plan and expected a direct route, via ATC vectors, to our destination. When I was issued my clearance I discovered that my 20 minute flight of 26 nautical miles (nm) had turned into a nearly two hour, 196 nm flight. 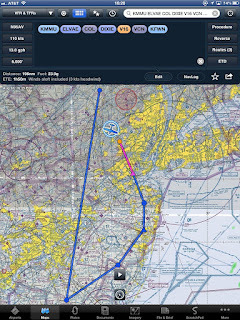 The first lesson I learned that day was not to take for granted the route that ATC will issue through busy airspace. Another lesson that I didn't learn until I got home was to always recompute fuel requirements when there's a change to your flight plan. I didn't top off my fuel tanks before I left my home airport since I was only expecting to fly about 20 minutes to a place where the aviation gas was significantly cheaper. However, even though I had almost three hours of fuel on board, it still should have crossed my mind. But, before leaving, I decided to turn down the clearance that I was issued (which is perfectly allowable). 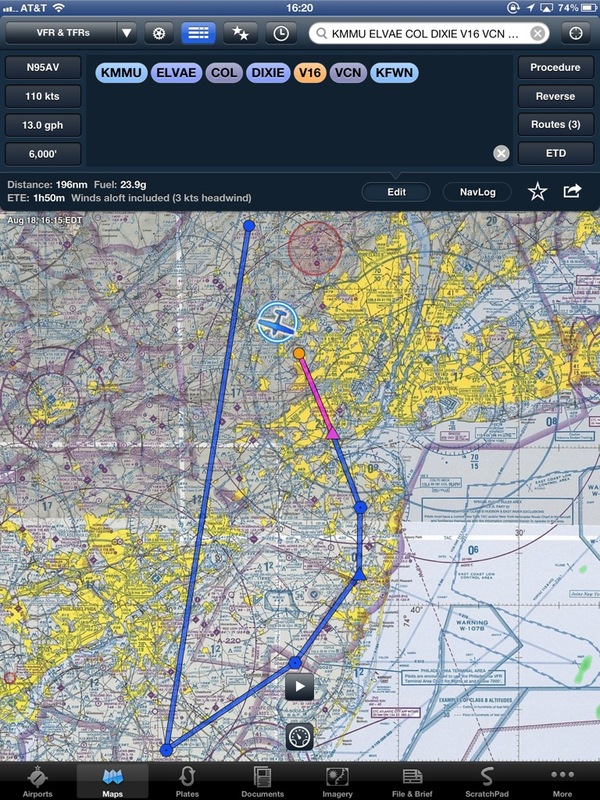 When I took off from my home airport of Morristown the weather was clear so I simply flew my route visually. About 20 minutes later I learned an even more important lesson. Since Sussex Airport doesn't have a control tower, I flew directly over it at 800' above the traffic pattern altitude. This procedure gives the pilot an opportunity to check the wind sock and runway conditions for any glaring problems. But, since I didn't suspect any issues at the airport, I wasn't looking for anything in particular. Everything seemed fine as I announced my position on the traffic advisory frequency until a voice recommended that I not land at Sussex Airport since a "plane had crashed" at the far end of the runway. Obviously, this seemed like good advice, so I turned around and, as we overflew Sussex airport on the way back to Morristown, we took a harder look at the runway. While we could see a King Air airplane at one end of the runway, there was no way to know that it had - as I found out today - landed with its landing gear up. In other words, the King Air pilot, who was returning to the airport after dropping off jumpers (parachutists), simply forgot to deploy his landing gear and he landed on the belly of the plane. You might be asking yourself, "How does a pilot forget to put down the landing gear?" That's a great question since an alarm will go off if you forget to put it down as you can hear in the following video. But, it happens more frequently than you'd expect. And don't take for granted that the runway's clear before landing. In today's online world of e-commerce, slammed servers are the equivalent to waiting on line. A buddy of mine that I've known since middle school is a lifelong Doctor Who fan. Yesterday, he called me and asked if I could order him some tickets for a Doctor Who movie showing later this month in New York City. I said that it wouldn't be a problem. Instead of setting a time for the tickets to go on sale the announcement was made via Twitter. The link in the tweet lead to a bit.ly link which redirected to clearviewcinemas.com. But that website was struggling under the load. Once it did load (if it did), there was a description of the event with a link to purchase the movie tickets on movietickets.com. All the traffic flooding into movietickets.com brought down their entire website. Even with all the benefits of the online world, queuing up and waiting on line at the theater would have been your best bet - we've only decentralized the problem. But, at 11¢ per ticket, how could you go wrong and not at least give it a try. I'm fortunate that my weight hasn't fluctuated much since college. But, from time to time, it might creep up 10 or 15 pounds which needs to be knocked back down. I've always believed that you don't gain 100 pounds without first gaining 50 pounds without first gaining 25 pounds, etc. So I try to remain vigilant. I enjoy running, so imagine going for a three mile run while carrying two five pound weights - being just ten pounds overweight will definitely slow you down. Eat less and workout more is what needs to be done. But that's an oversimplification - it takes more than physics to successfully lose weight, there's a huge physiological and psychological part. My goal when losing weight is to do it without increasing my workout routine. The key when deciding which foods to eat is to pay attention to the energy macronutrients (carbohydrates, proteins, and fats), before looking at the micronutrients (vitamins, minerals, antioxidants, etc). Traditionally, we think that low fat or no fat is good but consider which of the following is healthier: eating a tablespoon of sugar that's completely fat free or eating a tablespoon of flaxseed oil that's 100% fat. When it comes to fats and carbs, it's important to recognize the difference between good ones and bad ones. The nice thing about fats is that they give you a full feeling when you eat them but you want to stick to eating unsaturated fats while staying away from trans fats. With carbs, you'll want to eat complex carbs (high fiber) instead of refined simple carbs like sugar. The problem with eating simple carbs is that your body burns them up right away. In the world of carbs, simple sugars are like barbecuing with only lighter fluid whereas complex carbs provide the slow burn you get from charcoal. Over the years, I've tried different techniques and, in the end, it's a matter of finding what works. I've made a few surprising discoveries. Most people will weigh themselves the same time, everyday - usually first thing in the morning. It's not unusual, when dieting, to notice a pound, or more, difference from one day to the next. While this looks like progress, don't be too quick to celebrate because it's not a pound of fat that you lost. In theory, a pound of fat requires burning about 3,500 calories more than you've consumed. That's a big calorie deficit from one day to the next. A 200 pound person would have to run a marathon to burn that many calories. So, where did that missing pound come from? It's mostly water weight but that's still a good thing as long as you're drinking water and staying hydrated. Ironically, you'll need to drink plenty of water to keep the fat burning process going smoothly. The key to this diet is to make it a lifestyle. It starts with two weeks of indoctrination where you consume virtually no carbs that puts your body into a state called ketosis (more here) which weens your body off of carbs and simple sugars in a healthy way. When I do the two week indoctrination, I typically lose almost a pound each day. Also, since it only lasts for two weeks, it's not as unhealthy as it might seem when it comes to cholesterol, blood pressure, heart rate, etc. On the contrary, I find that these health indicators also drop with the weight loss - and I'm only loosing 10 - 15 pounds. After the first two weeks, I start to introduce more carbs into my diet without bingeing. The key is to look at the nutritional information on the foods that you're eating. The downside is that you have to be very careful when eating out. Fortunately, if you find that this weight loss technique works for you then there's no shortage of foods to make it easier designed by Atkins, PR Nutrition, The Zone, South Beach, Philip Maffetone, etc. I don't want to sound fanatical about a low carb diet. Most any diet will result in some weight loss since it restricts what you eat. I've simply found that the low carb solution works for me. "Low carbs" generally means that, after the two week indoctrination, no more than 40% of your calories come from carbs while the other 60% is split evenly between fat and protein. For this reason, it's sometimes referred to as the 40/30/30 diet. Obviously, exercise is important. But, don't suddenly increase your workout routine and expect the weight to melt off. Actually, whenever I increase my runs substantially, I notice a weight increase over the following week or two. I suspect that this is due to two things: my body retaining more water due to the added stress from the increased workouts and my increased appetite. While exercise is important in the long term, consider that running a mile might burn 70-110 calories. If you walk that same distance, you'll burn more of it as fat instead of carbs. Regardless, if you cover three miles you'll burn up to 300 calories. That's less than a single Boston Kreme Donut. Trust me, it's easier to skip the donut than to find the 60-90 minutes it takes to run or walk three miles (keep in mind that you'll need a shower if you run three miles, which also takes time.) Cutting back on 300-500 calories every day, without feeling hungry, is much better and it's surprisingly easier than you'd think during the two week indoctrination, especially when eating tasty nutrition bars. Reducing 500 calories, each day, equals one pound of fat per week. Keeping the weight off is always a challenge. Our bodies appear to have "set" points. In other words, our body likes to maintain the average weight it's been at during the past few months. So, if you can keep the weight off for six to nine months then you should be "set" unless you completely fall off the wagon. Most four-seat single-engine airplanes can't actually carry four adults with full fuel tanks, especially in the summer. There are three "enemies" to small, single-engine, airplanes: heat, height, and humidity. A piston engine aircraft's performance severely degrades as these three factors increase. The plane crash video, above, is unique in its clarity, first person point of view, and the fact that everyone survived. The passenger in the right seat stated to the NTSB that the plane was unable to climb more than 60 or 70 feet above the ground before experiencing a down draft as it collided with the tree tops. My initial reaction, when I saw this video, was that the plane was overloaded for the prevailing weather conditions. While drafting this blog post, my buddy, who's a commercial pilot / flight instructor, and I researched the airport and weather conditions as well as the aircraft's performance specifications. The key variable we didn't know was how much fuel was aboard the aircraft, for weight considerations, as we speculated the cause of the accident. The airport that they departed from was 6,370' above sea level, "on a high mountain valley surrounded by mountains," and the temperature was about 80°F. It's possible that the airplane may have been climbing, relative to sea level, but the ground was sloping up faster than the plane was climbing. Also, after running some back of the envelope calculations, we figured that it would be very easy for this airplane to be outside its operating envelope for ideal conditions, let alone the conditions at the high, hot, departure airport. I'd be surprised if the FAA investigation doesn't mention these factors in its final report in about 12-18 months. I experienced the high, high effects for the first time as I piloted my plane out of Las Vegas, last August, while carrying four adults. Fortunately, for me, my aircraft could handle these conditions since it was operating within its performance envelope. However, it was extremely obvious that I couldn't climb very fast. Air traffic control, who's used to seeing this type of degraded performance in the Las Vegas desert, simply had us circle a few times so we could gain enough altitude to get over the mountains on our way back to San Diego. 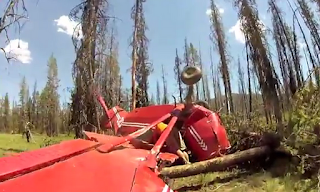 Plane crashes, like the one in this video, happen almost every day. Many are minor and most go unnoticed except by the local media. As a matter of fact, on the day this video was recorded there were six other plane crashes in the United States resulting in five fatalities. Ten years ago, I signed up for AT&T's top of the line business class DSL in Carlsbad. It's worked very well with five static IPs and 5 Mbps up / 600 Kbps down. With proper optimization, the servers on this circuit could handle 75,000 unique visitors each day. All of my professional and personal needs we met. Last fall, I signed up for Optimum's residential service in New Jersey which is amazingly fast as you can see in the graphic. Faster than FiOS and "faster than 95% of the US." The problem is that we keep needing more bandwidth and slowing down feels like going back in time. It feels so "dial up." In the past, I've optimized the Carlsbad business servers by pushing static resources into Amazon's cloud. But, I've noticed a recent problem with only 600 Kbps up. When I'd get home, after taking photos with my iPhone, they'd sync to iCloud. Surfing the web, during the automatic iCloud sync, is painfully slow and there's no way to optimize this process. I think it's time to find a faster connection for Carlsbad, unfortunately, there are only a couple choices. Over the past week, my wife and I have been visiting family and friends around the Midwest. A few days ago, when leaving Louisville for Cincinnati, one of the radios in our airplane stopped working. Since it's a secondary radio, it wasn't a big deal, but I missed the convenience of using it for ground services such as getting the airport weather and talking to ground control. When taxiing, I may have to use four different radio frequencies for receiving the weather and advisories, talking to the terminal (FBO) , picking up my flight clearance, and getting permission to taxi from ground control. Just before takeoff, I'll get takeoff clearance from the tower and then, shortly after takeoff, I'll have to flip over to air traffic control frequencies along my route. As I reach my destination, I'll need to receive the local airport weather and advisories and then, as soon as I taxi off the runway I have to immediately contact ground control. My point is that there are a lot of different frequencies to manage. I've found it easiest to keep track of my frequencies by breaking them down into two distant categories: air and ground. I keep the air frequencies on my top (primary) radio and my ground frequencies on my bottom (secondary) radio. The beauty of this system is that I can listen to two radios at once and, when someone is transmitting on the primary radio, it will block transmissions on the secondary radio. With my secondary radio out of service it meant that I'd have to temporarily switch away from the ATC frequency to the ground frequency to hear the important advisories, which is a bit of an inconvenience. Since my secondary radio was out of service, and I was traveling on vacation in the Cincinnati area, I had to find a local avionics shop that could help me out. I received a great recommendation for Cincinnati Avionics at Clermont County Airprot (I69) which also happens to be the home of Sporty's Pilot Shop - the pilot shop of pilot shops. You'd be hard pressed to find any pilot in the U.S. who hasn't heard of Sporty's. I made an appointment for Tuesday at 9 AM at Cincinnati Avionics and I arrived at my local airport, Butler County Airport (KHAO), with plenty of time. But, as I was preflighting my plane, a thunderstorm moved through so I had to sit it out in the plane for about 45 minutes until it passed. Scott testing out my secondary com/nav radio. Once the thunderstorm was out of the way, I took off for the 20 minute flight. Even though it was still raining, the flight was exceptionally smooth. As soon as I landed and taxied up to the avionics shop, the avionics tech that I'd been speaking to, Scott, came out to greet me just as I shut down the plane. Once Scott, who is also a former Marine, confirmed that my radio was properly seated in its chassis he pulled it out, took into his shop, and disassembled it on his bench. He checked out a few things on the radio and confirmed that the problem was actually with the radio and not with the airplane's power. Then he said, "this is the moment of truth," as he checked the radio's internal fuse. If it was just an issue with the fuse, that would be a quick fix. Otherwise, it could possibly mean replacing the entire radio which runs $4,000 – $5,000 since this radio also used for navigation. Luckily, once he replaced the fuse, everything worked fine. But, before he had time to repair it he told me that he had to run to a 9:30 AM meeting which would last about 20 minutes. He asked me if I'd like to visit Sporty's - which was a no brainier. So, he gave me the keys to their crew car and I drove over to the mecca of pilot's shops on the other side of the field. The retail portion of Sporty's pilot shop is only several hundred square feet. But the warehouse stocks virtually everything and it's "ginormous." They even have a dais so visitors can get a good view of the warehouse. In front of the store is their fleet of Cessnas for flight training with a large cafeteria on the second floor. After dodging thunderstorms while flying throughout the Midwest this past week I decided to get a Stratus which displays inflight weather directly on the iPad. The beauty of this device is that, unlike XM Aviation Weather, it doesn't require a subscription. The FAA broadcasts weather reports, at no charge, throughout the country, as part of its next generation flight tracking system, ADS-B. As luck would have it, there's only one place that sells the Stratus: Sporty's. After purchasing my Stratus, I headed back to the avionics shop to settle up and saddle up for the flight back to Butler County Airport. I noticed several thunderstorms moving in the direction of Butler County, but I still had plenty of time - after all, it was only a 17 minute flight back. When I got back to Butler County, I put my plane to bed and went into the terminal for about half an hour. While waiting for my ride, the staff at the terminal spilled outside to see a wicked cloud formation from the cold front that was moving in with the thunderstorm. Only the edge of the thunderstorm hit the airport, but it was still not gentle. On the way home I noticed many downed tree branches. The Stratus will definitely pay dividends in weather like this. In the end, it was a successful morning. Mission accomplished and it wasn't even noon, yet. The beauty of Twitter is that it's simply 140 characters of text. Shorter than an SMS text message - akin to a headline. Any other payload in the message is a hyperlink which is also text. "@joemoreno: Just arrived at the Top of the Rock. http://epics3.com/piqk"
Which begs another question: Why only 160 charters for an SMS? Because the inventor of SMS, Friedhelm Hillebrand, typed out random sentences and noticed that they fit into 160 characters. There have been some alternatives to Twitter, but they're just copies. What's the point of making a copy of Twitter if it still suffers from the same Achilles' heel: a centralized single point of failure controlled by one corporation? A worthy competitor to Twitter requires fundamental integration into the Internet's infrastructure. This shouldn't be too difficult, after all, it's just text --- or another way to think about it, it's just TXT. The Twitter alternative that I'm proposing simply uses DNS. In other words, a tweet would simply be stored as a DNS TXT record. Since it's widely recognized that DNS is the Internet's single point of failure, it has multiple, redundant and distributed, servers to keep it running. DNS servers have impeccable uptime stats because, without DNS we have no practical Internet connectivity. 1. No additional servers required. Simply add a new DNS record for each TXT tweet. 2. Redundantly propagated across multiple DNS servers. 3. Server load distributed to ISP DNS caches. In other words, massive traffic for a single tweet would not need to go back to the authoritative DNS server. Set a long TTL for the TXT tweet, say 24 or 48 hours, and each local ISP should only hit the authoritative DNS server once every day or two to refresh a particular tweet's TTL. 1. Can't easily delete tweets since they're cached at each ISP's DNS server, especially if added with a long TTL. 2. Tweets would need to be inserted into TXT records using a robust API - the only one I'm aware of is Amazon's Route 53 API. 3. Each TXT tweet would need to be a linked list to the previous tweet; or, perhaps, a double linked list to both previous and next TXT tweet. 4. Each TXT tweet would need an embedded timestamp (either UNIX timestamp: 1342472514 or a human readable dateTime object: 2012-07-16T20:38:00Z). 5. TXT tweets, unlike Twitter tweets, can be edited. 6. TXT tweets can expire after the TTL timesout. joemoreno.com. 1 IN TXT "2012-07-16T20:38:00Z|tweet4.joemoreno.com"
tweet4.joemoreno.com. 86400 IN TXT "\"2012-07-16T20:38:00Z | 40\16150'16.8\"N74\16127'57.6\"W | 31 years ago, today, Harry Chapin left us. http://blog.joemoreno.com/2011/07/harry-chapin.html | tweet3.joemoreno.com |\""
TXT tweet tweet4.joemoreno.com points to tweet3.joemoreno.com as the previous TXT tweet. tweet3.joemoreno.com. 86400 IN TXT "2012-07-16T20:36:00Z | | Yahoo has named Google executive Marissa Mayer as its new CEO. | tweet2.joemoreno.com | tweet4.joemoreno.com"
Practically speaking, we might be limited to 254 characters in a DNS TXT record in order to support older DNS servers. It's a tight fit, but it works with the timestamp, GPS encoding, 160 character TXT tweet, plus the previous and/or next TXT tweet host name. Several services need to be built on top of this proposal. Displaying a single user's TXT tweets can be rendered by a simple script running on a web server to display a specific user's feed. Mixing different user feeds, chronologically, is a little harder, but very doable. However, where it gets challenging is how to handle "follows" and "mentions." In both cases, a server would need to either push or pull these notifications in real time. Pulling could be simple polling, like an RSS feed query. But, push notifications can be a bit more challenging. I'll have to think about how this part would work. The primary purpose for planning is to get results by controlling events. Over the years, I've learned how to plan to forget everything that I need to do and organize in a way so that I could afford to forget. The key is to organize my tasks so they are either self-prioritizing (we never forget to wear our shoes to work) or ensure that they come in front of me at the appropriate time. This seemingly simple advice took me a long time to master. But, now that it's a habit that makes for relaxing evenings since I can free my mind from work. I come from a rather casual family. I like to use the term, "Neapolitan," to describe my New York Italian upbringing. In simple terms, this means that my family was always late to events, or, rather, we considered 90 minutes late to be on time. When I was 18 years old I joined the Marines. The Marine Corps obviously had a different philosophy about timeliness and tardiness. Being late was a crime known as UA (AWOL). "Hurry up and wait," was the norm as well as other axioms such as, "To err is human; to forgive is divine. Neither of which is Marine Corps policy." Two events from my time as a Marine helped me refine my time management skills. When I was a corporal, we were getting ready to make an amphibious landing, during an exercise, after spending two weeks aboard ship. Technical aside: We were testing out new military equipment which we could use to set up simple, secure, chatrooms. It was nothing more than a specialized piece of hardware that could interface with an encrypted military radio system (PRC-77 and KY-57) using Procomm software that was very popular in the pre-TCP/IP world of the mid-1980s. While preparing for our amphibious assault, I had packed up the equipment and then, unbeknownst to me, another Marine had placed it on a chair and slid it under the desk to tidy up our workspace. Instead of making a list of materiel to bring ashore, I just glanced around the desk and saw that there was no visible equipment - I completely missed the fact that the laptop and communications equipment were tucked under the desk on the chair. When we got ashore and discovered that the comm gear was missing I received a nice reaming from my captain. Lesson #1: Write it down. About seven years later, when I was a first lieutenant, I was deployed with a MEU made up of four ships sailing for the Persian Gulf. While in the middle of the Pacific Ocean, I was supervising the transfer of supplies from one ship to another - known as cross-decking. To make a long story short, the supplies didn't get palletized in time to make the scheduled helicopter. Lesson #2: Plan It Out. As a Marine supply officer I was responsible for ensuring that we tracked all of the equipment in our battalion - after all, it was entrusted to us by the U.S. tax payer. This process was accomplished using a cryptically named procedure referred to as the quarterly CMR reconciliation. Since I, working in the supply warehouse, didn't have day to day control over, say, the rifles in the armory or the Humvees in the motor pool, we'd ensure that these items were tracked by a specific person, designated in writing, known as the Responsible Officer (RO). We had about a dozen CMR accounts in our battalion and, once a quarter, we'd task the RO to physically inventory each item within 15 calendar days as per the Marine Corps Order (at the time, deadline extensions were not allowed). The problem is, even with the ROs best intentions to complete the inventory, on time, the CMRs were rarely completed by many ROs within 15 days for a host of legitimate reasons. Although this wasn't my responsibility, it would always come back to bite me, later, when our records were inspected annually. I tried a variety of techniques to improve this process. One option was to have the RO sign a letter of intent that the inventory would be completed within 15 days. But, when the CMR still wasn't done on time (again, usually due to circumstances beyond our control) I was stuck with the same "ding" on our inspection. Another option was to get the CO or XO involved in the process, each quarter, but that still didn't work. Of course, we could have backdated the CMRs - formally known as fraud - but we never did that. I'd rather take the hit on the inspection. After trying a host of different techniques, we finally found one that worked. Instead of issuing out all CMRs to all the ROs at the same time, we'd meet with each RO, before the beginning of each quarter, to see when he wanted to conduct his inventory. This definitely made our job, in the supply section, harder since we had to track a dozen different CMR deadlines, but that's what it took to get the job done. We put up a large white board in our office so we could easily see the status of each CMR. Problem solved. After my mistake, when I was supervising the pallet cross decking, I became intrigued with time management. I needed to find a way to better track tasks. I tried different techniques and studied time management books ranging from Time Management for Dummies to Stephen Covey's The Seven Habits of Highly Effective People and First Things First. Many of these teachings focused on the four generations of time management. The key that I discovered in the mid 1990s was to carry a day planner with me, all the time, and write down every task and appointment. I wouldn't check off a task until I had confirmed that it had been completed. Any to-do item that didn't get done today was moved forward to the next day's list in my day planner. After a few days of rewriting low priority tasks, I either got it done or explicitly dropped that to-do since it was no longer important. I didn't prioritize to-dos with letters or numbers, such as A, B, or C - that just doesn't work on paper. If there was something on my list that was urgent or important, I simply highlighted it with a yellow highlighter. I photocopied important lists - such as a list of all the equipment in our infantry battalion or a list of the supply chain status codes, etc - and added them to my day planner so that they were always at my finger tips. ☐ Sgt Smith - Complete maintenance report and fax to HQ. ☐ Sgt Smith - Complete maintenance report and fax to HQ. By Thursday close of business. I ended up turning my time management techniques into a 74 page workbook that I used to train others. All of these techniques worked fine until the consumerization of IT resulting in the proliferation of personal smart phones and tablets in the workplace. Carrying around a day planner was no longer practical. While the fundamentals of the time management skills I learned haven't changed, the implementation is much easier in the digital world. No more carrying around a paper based day planner or writing and rewriting tasks on paper. Over the past year, I've learned how to simply use my iPhone, iPad, and Mac to easily manage my time and tasks via iCloud. You don't need all of these devices and services - just an iPad, alone, will suffice - but I found it very convenient to have it all tied together and kept in sync. However, if you're not disciplined enough to follow my first lesson - write it down - then it won't work. Keeping track of meetings and appointments is much simpler, now, since you'll probably be notified of an upcoming meeting, via e-mail, with either an Exchange or iCal invitation. As a matter of fact, you probably won't even see the e-mail with the calendar attachment; instead your device will automatically place the meeting invitation on your calendar where you can answer Yes / No / Maybe. One gotcha when using iOS devices in a Microsoft Exchange environment is that, occasionally, if you accept a meeting on Windows it might not show up on your iOS device. 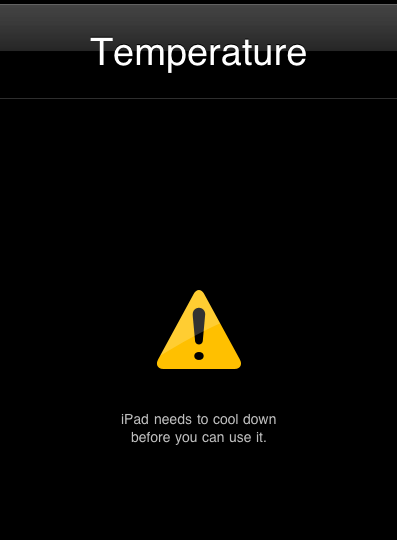 The key to preventing this is to only accept meetings on your iOS devices. If you accidentally accept a meeting on your Windows computer and it doesn't show up on your iOS device, then you can forward the meeting from Outlook, to yourself, as an iCal invitation. The iCal and Exchange meeting invite won't be in sync if the meeting time changes, but it's better than completely forgetting about the meeting. Every time you come up with a new to-do task then write it down in your device. Since iCloud syncs everything for you - usually within seconds - then it doesn't matter where you write it down since it'll show up on all of your devices and computers. 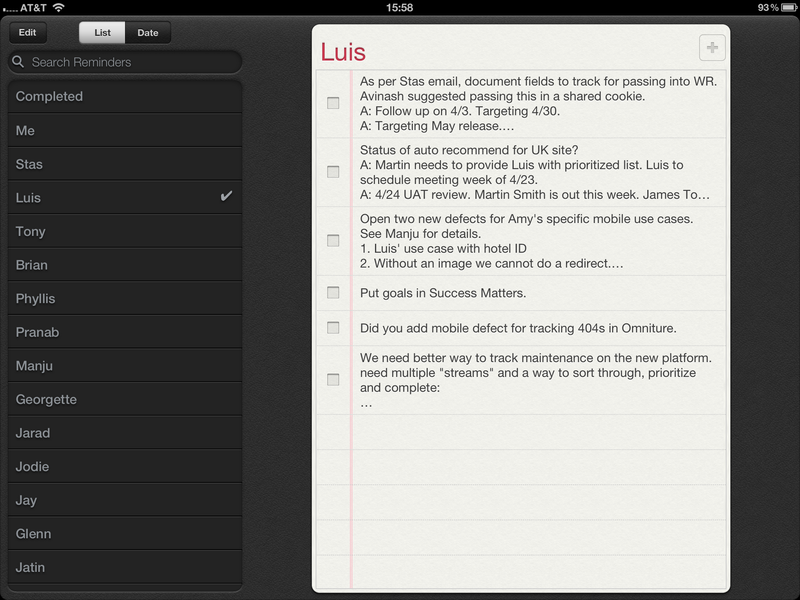 I use iOS's free Reminders app which is a simple way to track a list of tasks. I've labeled one list "Me," which are tasks that I need to complete. I've also created a list for each person that I interact with on a daily basis. As to-do tasks come up that I need to delegate, I write them down on that person's list. Now, whenever I'm talking to that person, I can just look at the person's to-do list in my Reminders app. The key, when jotting down tasks for delegation, is to write out the to-do reminder as you'd actually ask it. For example, if you only write down "Report" then there's a good chance that you'll forget which report, etc, you were going to ask about. It's better to write down as much detail as possible; for example, "What is the status of the maintenance report that's due to the COO tomorrow afternoon?" After each tasking that isn't fully completed, I put an "A:" and jot down the "answer" to the question I asked or its status. That way, when we reviewed it later we could pick up from where we left off. Over the years I've sat in some long meetings and conference calls. It's impossible to remember every decision, tasking, issue, and due date from every meeting. I've found it very handy to capture all of this information in the iOS Notes app. This is especially handy since it's searchable. I generally create a separate note for each project where I can track key events and decisions. Many times, project information will be passed via e-mail, so it's simple to copy and paste it directly into the respective note. When deadlines changes, it helps to explicitly capture that, too. Remember, to have a fighting chance, you'll need to get into the habit of always writing down all of your tasks.